About 1030pm Saturday night, my brother Benjamin , his wife Ingrid and their son Lennox were headed to their home in California. Benjamin was driving, they were a block from their home. A guy driving an extended cab truck came flying around the corner, wheels squealing and slammed into them. They went through a guardrail and stopped facing the opposite direction. The truck smashed into the driver's side, more fully on the rear passenger door. Unfortunately, this is where Lennox sat in his car seat. All the air bags deployed (side and front). Benjamin and Ingrid sustained minimal injuries. Lennox sustained an open skull fracture with the location being slightly above his left eye. He had initial surgery to repair the outside wound over the left eyebrow area, which took about 6 stitches. He later had another surgery which involved opening the scalp at the hairline, peeling it off the skull to expose the damage, irrigating the area (which flushed out some small piece of bone but no debris. ) Then they positioned the depressed bone and stitched him back up. At this time he is awake. The guy that him them left the scene of the accident. A Border Patrol officer arrived very quickly on the scene and was instrumental in getting the ambulance to arrive very quickly, as well as to mobilize other BP officers who were able to, almost miraculously, apprehend the suspected driver of the truck. They are going to have huge medical bills, co- pays, loss of time at work, and they will need to buy a car. Please help, Anything is appreciated! There is no donation too small. So many wonderful people ask for updates on Lennox's condition and I always struggle with what to say. I want so badly to be able to talk about how much Lennox has improved and to give people good news for a change and I just don't have anything like that to share. The focus of Lennox's treatment has shifted to adapting to his new level of cognitive function and away from treating "symptoms" that we had hoped would disappear over time. His incision still hasn't quite healed where it meets the top of his ear, but he's grown enough hair to cover most of it up. He really looks adorable with the blonde, spiky new growth sticking out. The incision can't be exposed to any sunlight. I'm actually thinking about making, "Hey, where's your hat?" our official family motto in honor of the fact that you can't spend a day with us without hearing it over and over whenever Lennox steps outside. Finding the right academic with smaller classrooms has been challenging, especially one that would allow for all of the appointments Lennox attends with a wide range of providers. Lennox isn't cleared for a lot of activities that allow him to spend time with kids his age, so we've considered homeschool hybrid programs that will give him at least a couple of days of socialization in school. We're just incredibly anxious at the thought of sending him anywhere without us. He's emotional and easily lost and confused due to difficulties with short-term memory. We're still trying to understand what's going on with Lennox's seizure-like activity. He needs constant supervision, especially around stairs, because he unexpectedly stops in the middle of what he's doing and goes "blank" for a few seconds, having no idea what he was doing when he can speak again. He still struggles with trying to find the right words for things, and he often forgets that he's done something immediately after doing it. This morning, he asked if we could please make scrambled eggs for breakfast ten minutes after he had cracked and whisked five eggs. Things like that happen multiple times a day, and the look of confusion on his face when you gently explain that something really did happen already is really upsetting. Lennox still gets upset whenever we need to get in the car. We didn't renew our Disneyland annual passes when the contract was up for financial reasons, but when I reminded Lennox of a Disney event he loves that we had booked prior to the accident, he began to sob and beg us to stay home and not attend. I know it's trivial in the grand scheme of things, but it's frustrating to realize that Lennox's favorite place in the world was ruined for him on top of everything else he's endured. I'm trying to focus this update on Lennox, rather than the person who caused this and relevant legal issues. It's been a disappointing week, to say the least, and a mistrial was declared due to the jury being hopelessly deadlocked on the federal DUI hit-and-run charges.We'll find out on September 18th if the case will go back to court. This is all I can really say about the trial without sounding like a very angry, bitter, outraged person. The driver and his wife still refuse to cooperate with our insurance company and the investigation has essentially stalled-out while a legal team is assembled to determine responsibility for their truck, which was uninsured and still registered to a previous owner who had sold it to a dealership. As I've said before, "thank you" just isn't enough. I still struggle to find a way to express how grateful our family is for all of the support and encouragement we continue to receive. Several times during the trial, after hours of hearing horrific testimony and looking at enlarged pictures of Lennox's injuries, I felt like I was going to have a complete, and very public, breakdown. We have no family here and it's very hard to sit alone in court while the defendant's friends and family filtered in and out of the courtroom all day, smiling and winking back and forth with him. Pulling up and reading through all of the amazingly kind posts/comments from you was the only thing I could think to do in order to keep myself sane, and it worked every time. It reminded me that we're never alone in this. There may be support for the defendant in the courtroom, but we have the support of thousands of people from all over who are hoping and waiting with us to see justice for Lennox. Thank you for everything you've done and continue to do to help us get through a very hard time. We are more grateful than you could imagine. Lennox was allowed to go home from the hospital on Tuesday 18 days after he was first admitted. His case will remain open at the hospital so his treatment team can follow his recovery through outpatient services and quickly admit him if there are any signs of infection or additional complications. He has several follow-up appointments but it's great to know he's being monitored while he's able to rest at home vs. the hospital. I think Lennox has hugged the dog close to 800 times since he came home. He's struggling with the new limitations in place due to the head injury. He can't ride his bike or run around outside with the dog. He can't run around, period. He loves his loft bed but he can't sleep in it because he isn't allowed to climb up and down ladders. We're all just so grateful that was Lennox was able to go home, period, but I think he expected that going home meant everything would go back to being "normal" and he gets really sad and frustrated when he's reminded he needs to take it easy. Lennox is covered in a rash. The antibiotics were really hard on his body, and some doctors thought the rash might be part of his reaction to them, others thought it looks like a viral thing. Lennox is really uncomfortable and itchy. His Mom and Dad have kept him covered in lotion and apply cold packs to his back and stomach, which gives him a little relief. He woke up every half hour or so last night crying and itchy, and he'd fall back to sleep after new cold packs were applied to his skin. The rash spread to his face today, but we're hoping it will start to get better soon. If you can suggest anything else to help with the itchiness, we would love to hear your ideas. I've tried so hard to find the right words to express how grateful we are for the outpouring of love and support we've received for Lennox. "Thank you" just isn't enough. Lennox's Mom and Dad are trying to stay positive and focused on ensuring Lennox receives comprehensive care while helping him heal physically and emotionally. Your notes of encouragement, love and prayers are so appreciated. For more updates you can follow Ingrid (Lennox's Mom) on FaceBook. Lennox's condition hasn't really changed since the last update, but I know that a lot of people are wondering how he's doing. His activity is still pretty limited to anything that wouldn't put him at risk of bumping his head, but as many of you have seen in the YouTube videos Lennox likes to create (which, I've noticed, all seem to showcase one mess or another in our house) he's making the best of things. Lennox has received referrals for physical therapy, speech therapy, and neuropsychology. His memory and speech issues seem to be permanent at this point, and the goal is to teach him little tricks and workarounds to minimize his frustration and fear when he gets "lost" or "stuck." Lennox will continue to work with his neurology team to get a better understanding of what's happening when he exhibits behaviors that his doctors believe are seizure-related. After two days of testimony, a judge ruled there was enough evidence to put the man who hit us and fled the scene on trial. He has pled "not guilty" despite the fact that he was found in the driver's seat shortly after the accident by border patrol agents, and the photos taken after his arrest that show abrasions where a driver's-side seatbelt would have left a mark in this type of collision. I'm disappointed that he refuses to accept any responsibility for his actions, and I was stunned by the complete lack of remorse both he and his passenger have shown for fleeing the scene and leaving us alone with our critically injured child on the side of the road. The passenger estimated that he and the driver had consumed approximately 14 beers each before taking turns behind the wheel. Your support and words of encouragement continue to sustain us through this difficult time. Lennox has received so many messages and YouTube videos from people all over the country who are pulling for him and want him to know how proud of him they are for his bravery. This has had a profound effect on his ability to endure difficult outpatient treatment and his ability to stay positive when faced with discouraging days. Our family is so grateful for the love and kindness we've received, and I can't express how much it means to know that Lennox is still in your thoughts and prayers, to know our family hasn't faced a day of this alone and without your support. 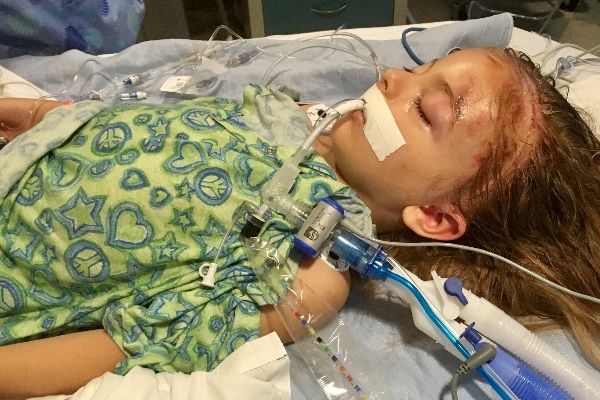 Sad story here for this little boy in car wreck caused by illegal immigrant deported 15 times. Check out the real story on fox news. Here is a real life example of why we need to enforce our immigration laws. Wake up sanctuary snowflakers! This could be your child. I donated 25 dollars. Can you? My daughter is 6 years old, I can't imagine the emotional turmoil this has caused your family. We will be praying for sweet Lennox. God bless you and heal you. I saw Ben on Fox News this morning and my heart breaks for them. Praying for a full recovery for Lennox and so thankful for God sparing the whole family. This is why we MUST secure our boarders! Get well buddy! Every donation helps! Just saw Ben on Fox News, heart breaking. Hope his son makes a full recovery. I will be praying vigilantly for precious 6-year-old Lennox, and all your Family. I'm so sorry. I echo those who have already said it, PROTECT OUR BORDERS! NO SANCTUARY CITIES IN AMERICA! I pray for Lennox's recovery and for his family. Prayers also to the nurses and doctors who are caring for this little guy, may they have all they need to care for Lennox. Just remember, this could happen to one of your family members but I pray that it doesn't. Just saw Ben Lake on Fox News. So sorry for the this terrible event. . I pray Ben your son will recover fully. Ben used to stay at our house in Maine years back. God bless you, Ingrid and your family. Your family is in my prayers.Prayers for a full recovery. Stay POSITIVE..
Lennox will be in my prAyers every day and night Til he is completely well! Stay strong and believe in miracles. I do! Such a sad story! Lennox will make a full recovery. I pray for him and your family everyday! I believe this will only get worse. A cop pulled over a drunk driver in front of my brothers home. The non-English Hispanic was so drunk he fell out of the drivers seat on to the ground. The cops put him in the passengers seat and let his wife drive off. No ticket, no arrest...no nothing. He will recover, keep the faith & stay strong! Little Lennox, we are all pulling for you, your a champion, you can do this! I pray for a miraculous and speedy recovery and for the Lord's provision for all your needs. My son spent 10 weeks recovering in the hospital and it changed our lives. Our sone is doing amazingly well today and is one of our miracle stories. I pray that you will have a miracle story to share with the world as well. Glad to know you are home, Lennox. You can hug your doggy and your Mommy, Daddy and brothers anytime you want. Hang in there little buddy, you have so many friends out here who are praying for your recovery. We are just so happy you are home! Thank you for the updates, I'm always hopeful for good news when I see you've posted! Lennox's story has really resonated with us, my children and I pray for him daily. My daughter feels like he is her friend, although they've never met. Continued prayers for this sweet boy and your family. Lots of hugs to all of you. Praying for dear Lennox, God bless you all. I lift Lennox up in prayer. I cannot imagine the amount of worry you are all consumed with. I pray justice prevails and this person goes away indefinitely. God bless. This is my worst nightmare, and truly any parents biggest fear, is traveling anywhere with my kid in the car, and other people who have no cares about who they might hurt by drunk driving. Our love, prayers and hopes for a speedy recovery are with you Lennox! If you gain a half inch, it's a half inch gain. -U.S. Army [B.Martin] Keep gaining, keep getting better and keep the faith. Carry On ! May God bless Lennox & his family with a speedy & full recovery.